I was wondering why the conflicts, missile deployments etc. throughout the Cold War were basically all taking place in Europe, Africa and Asia, when in fact the US and Soviet Union were only separated by a few kilometers over the Pacific. Wouldn't that have been the "ideal" area for a nuclear standoff? This also makes the Cuba Crisis look weird to me. Why make such a big deal out of transporting missiles all the way to Cuba, when the Soviets could have just moved and placed them within their own territory? This is because fundamentally, the Cold War was about which ideology would dominate the world. Both sides wanted to export their ideology, or perhaps more importantly, stop each other from doing so. To this end they were willing to fund, supply, and equip forces across the globe with the right (or ostensibly right enough) ideological credentials. The result is conflicts everywhere. However, fighting did not occur in American or Soviet territories. According to deterrence theory, the extreme destructiveness of nuclear weapons meant both the Soviet Union and the United States avoided fighting each other directly. Both sides feared that any fighting could escalate into a nuclear exchange, which would result in mutually assured destruction This extended to attacks on close allies of both sides, which is why armed conflict actually did not take place in Europe. Since both sides regarded Europe to be integral to their interests, alliances backed up by troop presences were constructed on either side of the Iron Curtain. An attack on either side in Europe would result in attacking each other's troops, which was in theory bound to trigger full out war between the two superpowers. If you attempt force way through [Berlin] we will oppose by force; war bound to be thermonuclear and though you and we may survive all your European allies will be completely destroyed. Consequently, actual armed conflict devolved into a series of proxy wars in the developing world. Likewise, the Soviet Union maintained several bases throughout its constituent republics. 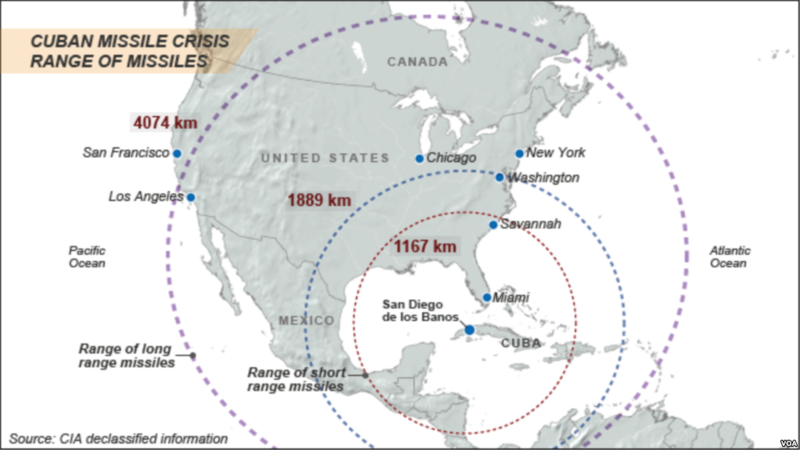 Geography is the reason missiles on Cuba was perceived as a big deal. Soviet weapons at the time could attack Alaska from Siberia, but little else. Even from Provideniya on the tip of Siberia, it's as much as 3,500 km just to get to Seattle. Most of the Continental US would have been out of range of even the most long ranged Soviet missiles at the time. In contrast, the weapons from Cuba could devastate America's political, population and economical centres along the East Coast. Even the medium ranged missiles could menace Washington D.C., and short ranged missiles were enough to take out most of the Gulf Coast. That is an existential threat compared to Alaska. This question made me scratch my head for a minute. I think there may be some false premises in the OP's question that have been overlooked. I will paraphrase the Q: "Why didn't they aim nuclear weapons at each other at the places where their landmasses were the closest?" So 1: Nuclear weapons are mostly intended to be sent far, far away. Their immediate devastation and long-term effects make them something you don't want any good guys to be near, with the exception of last-resort weapons like the nuclear artillery and nuclear backpacks. Also there is no point having nukes facing off against nukes in an isolated theater. No one thinks they can kill the others' before launch, so if either one fired, the other would fire before the first guy's landed, meaning both sides' nukes would land on empty launchers and the skeleton crews manning them. Mostly though, point 1 hinges on point 2: While military equipment is indeed hardened against the effects of a nuclear blast and after-effect, nuclear strategy is not centered around destroying the bad guy's army, per se. Nuclear weapons are fielded with the intention of destroying the offending civilization in its entirety. Granted, the bad guy's army will hopefully be destroyed too, but if that were the real goal there would be far fewer nuclear weapons deployed -- only enough to kill military installations. A rough guess is it would only take 5 shots per opposing military installation to have a good chance of eliminating that installation. Meanwhile, when Reagan and the Soviets were negotiating arms reductions, the Soviets were looking at nuking the continental USA itself a few times over. 3: The reason we massed armies in West Germany was because that's where the people were. In some conflicts you just want land. So you go after the land. When you want to subdue a country, land is not the goal, so you go after its population centers and seats of gov't. Then, in the Civil War to subdue the south we changed things up to where you didn't just capture the capital city and declare victory-- you needed to kill the bad guy's army. And so it is to this day with conventional (non-nuclear war). However, as Semaphore pointed out, the cold war was a war of ideas and ideas aren't land and they aren't armies-- they're people who live in population centers. And with a war of ideologies you want to subdue the people. So that's where the armies are going to go. Now it apparently wasn't a GIVEN that the 3rd world war would be nuclear, or else why the massed military buildup in Europe? So what we can ultimately see is that the reason there weren't a bunch of nukes in the arctic is because there was no one there to kill. The non-nuclear armies wouldn't mass there either because there was nothing to defend other than land and since land isn't what either one was really going after it would be a waste to attack or defend en masse there. Finally, again there is no point having nukes facing off against nukes in an isolated theater where they won't knock out other nukes or kill lots of people. The reason that they fought everywhere but by each other's northern border is that they fought where people are, where people (governments) could be influenced. AND, I might add, these proxy wars were not nuclear standoffs, with the exclusion of Turkish and Cuban missiles which were emplaced to improve the ability to wipe out the other's center of civilization. The reason the Cold War resulted in conflicts across the world and not just between the US and USSR's closest points is because neither side wanted to actually enter into open hostilities, because that would definitely result in total destruction of both sides. The point of the nuclear buildup wasn't to use the weapons, but to prevent the other guy from using their weapons. This was the Mutually Assured Destruction(MAD) doctrine. So, if the USSR and the US started developing long range missiles and placing them as close to the other's territory as possible, that would be a clear sign of aggression that could lead to war. So, they fought proxy wars instead. Does Cuba have Russian missiles pointing at America, and does Greece have American missiles pointing at Russia? That's obviously not the US or USSR fighting, that's just two small countries 'defending themselves' from foreign influence. If Korea or Vietnam became communist or capitalist and allied with one side of the Cold War? Those are potential staging areas for further conflicts for spheres of influence. Alaska and the Russian Far East are a terrible place to have a standoff of any kind. Alaska had a population of some 130,000 people in the 1950’s which rose to some 500,000 at the end of the cold war. Furthermore, it was not a state of the US until 1959. Russia’s Far East (not Siberia; ironically that is more to the West) was equally empty with only 100,000 people living in the Chukotka Autonomous Oblast (the bit just across the Bering strait) which rose to 160,000 by the end of the Cold War. Fighting a war is usually about strategy. You usually don’t aim for large, empty spaces like the Far East or Alaska. You want to bring down the enemy by taking their political and economic centres. For the USSR, that was Moscow, Moscow, St. Petersburg, Moscow and a few large cities on the Transsiberian string of pearls. For the US, that was the northern East coast (DC, New York) and the southern half of California on the West coast; maybe also adding some South coast areas to the list. Threatening to take over Alaska/the Far East was laughable. The nuclear standoff was not about having two nuclear armies on each side of the inner-German border, each one ready to slap back should the other slap. The nuclear standoff was threatening to bypass whatever may have been in the way and just wiping out the important cities even from behind the initial lines. If you step away a bit from "just" the nukes, you'll see that there would be very little benefit to acquiring a beachhead on the enemy territory in Siberia or Alaska. Those locations have resources, yes, but provide no immediate means to expand and menace your enemy's core valuable areas which are too far away. Extreme weather conditions would also hamper offensive operations outside of narrow seasonal bands. As the threat model shifted from bombers carrying nukes to ICBMs and then SLBMs, the North's value was more in early warning/surveillance than anything else. Plus, a big part of the cold war was deniability and directly attacking your opponent's territory with your own troops doesn't work with that. So, big escalation risk, little beneficial upside. Without nukes, we'd probably have had a war on the Germany - Moscow axis instead. Your question is based on a false premise, that false premise being that the US and the USSR actually wanted to go to war with each other. In the large sense, they didn't, for a variety of reasons but two primary ones were (1) how expensive in blood and treasure World War II had been, and (2) the consequences of actually using the nuclear weapons that both sides had. What war was the Cold War? The Cold War was a state of political and military tension after World War II between powers in the Western Bloc (the United States, its NATO allies and others) and powers in the Eastern Bloc (the Soviet Union and its satellite states). The Cold War was a term used to describe the geostrategic situation between two global powers who had the means to start World War III, but neither really wanted to start World War III since it would destroy the world each was trying to influence or control. The strategic aims of both the Western bloc and the Eastern bloc was whose ideology and political system would prevail. Simply blowing up parts of each others' country was irrelevant to that aim. The various regional wars related to the West/East bloc political struggle were local tensions that were backed by either the east, the west, or both as they pursued their global strategy. The two power blocs were both trying to ensure that in any given region, the outcome of those local conflicts would result in a government who would be friendly to their side. To a certain extent, a core assumption that it was a zero sum game. See Game Theory for more on that problem of the zero sum game, which in this case is simplified as "If they aren't on our side, they are on the opposing side!" As to your confusion regarding the Cuban Missile Crisis: Kruschev wanted the Americans to feel the same discomfort the Russians/Soviets felt with nuclear weapons being based in unfriendly countries near to their borders. It was a political gambit that was consistent with the threatening and posturing both sides engaged in after World War II ended, and before the strategic Arms Limitations Treaty/Talks (SALT) in the early 1970's. That crisis led to establishing a hot line between Washington DC and Moscow, removal of some American missiles from Turkey, and political momentum building to reduce the risk of an actual nuclear war breaking out. (The SALT was a direct child of that political momentum). I lived behind the Iron Curtain as a child. I grew up in and was immersed in the Cold War for the first half of my adult life. To say that I've both lived with and had to study the cold war in detail is an understatement. Strategists sometimes fantasise about a nuclear standoff were the biblical Armageddon is the role model. Knowing fully well that not only WOPR calculated correctly that the winner would be none. A more limited exchange would always be the preferred option. However crazy this might sound, we are talking about strategising military minds, like MacArthur, LeMay or Dr. Strangelove. It has been said that the American strategy was like Poker and the Soviet strategy was like Chess. Oddly incompatible as it might seem this worked out for the US which most of the time raised the stakes just high enough. Until the seventies, communism was seen as an unstoppable juggernaut. You can see this in instances of the Sputnik shock, Domino theory, convergence theory. As more and more developing countries got their independence most were impressed with soviet-style industrialisation and other niceties that made that model so attractive to them. The reds encroaching the globe? Americans felt the need to counteract that by any means necessary, wherever. World revolution was imminent! The Soviets could really lean back on that since history was on their side. They had the scientific theory of Hegelian Marxism to support that and the newspaper headlines following decolonisation as proof. So they were mostly paranoid about protecting their claims, their revolution, their country and those of their allies from hostile capitalists. Reaching the territory of your enemy with nuclear rockets was solved with intercontinental ballistic missiles (ICBMs). The Soviet R7 had a range of 12000 km and refined variants of it are still in service today. Without a very reliable pre-warning system and no chance of intercepting it when it's underway, even a single warhead can wreak widespread havoc if detonated miles. Not by the blast itself, not by the fallout. An electromagnetic pulse (EMP) will cripple large swathes of electricity dependent infra structure. While some military hardware is said to be protected or hardened against such events – now – civilian life to support any further warfare will be greatly disadvantaged. How many they really had was never fully known to the West and while the CIA had relatively low estimates huge numbers reported publicly were very useful in scaring voters into rallying around a flag. 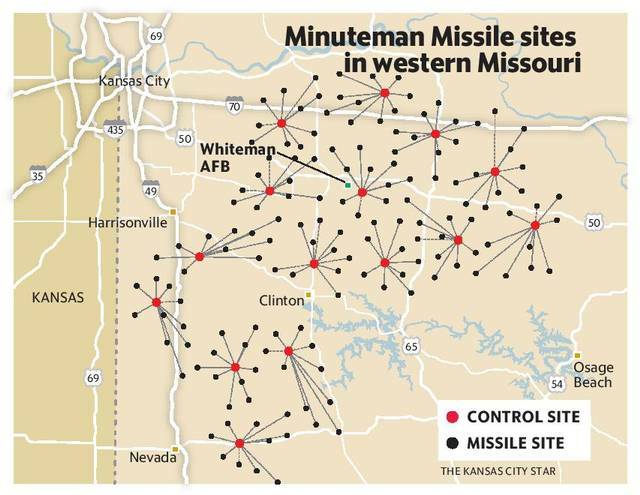 In case of a full exchange the actual missile deployment sites would be prime targets. Solution: spread them out, some should survive the onslaught. Do that not only on your very own territory, try to put them everywhere you can. Put them into Turkey, put them onto Cuba can be seen as part of that strategy. So close to target they can be made smaller and do not need such large range. And it can be argued that wherever these missiles were deployed, that was their territory. But that's not all to it. A crucial factor in these shorter range missiles is of cause cost. ICBMs that fly around half the world are large and need more precision in guidance systems, more fuel , etc. As so often small is beautifully cheap. Small is easier to hide. Another crucial factor is time. Time to target and time to prepare for incoming are obviously much shorter if a missile is fired that much closer to home. Regarding Cuba especially: Castro was not firmly communist from the start. Only after the revolution against Batista and his failed attempt to secure good relations with the US and aid from the US he turned to his second best option: the Soviet Union. Monroe doctrine aside the US tried very hard to get rid of him, even invaded the Bay of Pigs to make a small regime change in their interests favour. So, there was another very practical reason at hand. Not for the Soviet Union, but for Cuba. They begged the Soviets for missiles to prevent further US mingling with their country. As seen after the Cuban missile crisis was over, it worked both ways. Not the answer you're looking for? Browse other questions tagged united-states soviet-union cold-war geography or ask your own question. To what extent was the Cold War caused by post World War 2 economics? Is it fair to say that the USSR has technical parity over NATO on land and air over much of the cold war? How efficient was the (Cold War) Red Scare?